This article details tests on a transformer purchased around Feb 2017. 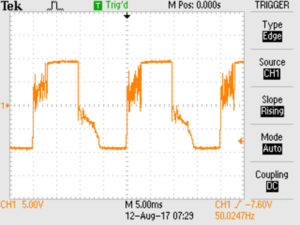 Seeing online discussion where there was no mention of the risk of damage if the output was disconnected, I performed a simple test where I monitored the output voltage with an external load (burden) sufficient to cause 50V on the secondary, 50V should be well within winding insulation ratings (4.7kΩ for this transformer at 20A). In the event, voltage was limited, so the external load was removed and the SCT-010-000 was measured bare with about 20A of primary current. Above, the output voltage is clearly limited to about 18Vpp, the clipping indicates a circuit similar to two inverse series 9V Zeners across the output. 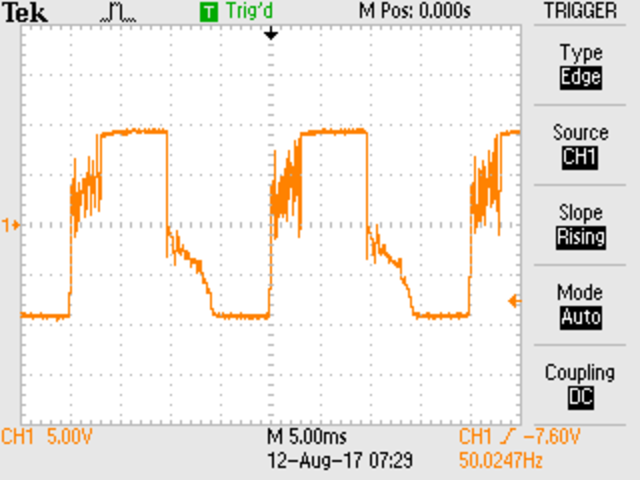 My own experience with Chinese Zener diodes is that they have very wide tolerance, and that might suggest that individual CTs may vary 20% or more… but that is not terribly important as they would normally operate at less than 5Vpp with microprocessor projects. Above is the schematic given in the datasheet. It shows a TVS which behaves similarly to two inverse parallel Zener diodes. The test above indicates the peak output voltage is about 20Vpp. 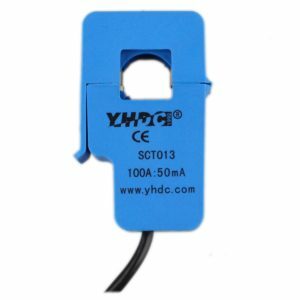 So, with the limiter contained in the assembly, it is safe to unplug the CT from its external load whilst current flows in the primary circuit.